Family game time is a favorite in our house. The girls really enjoy sitting down as a family and playing a good game. Loo Loo is just getting to the age when she can understand games better and play along with us. The Learning Resources Take 10! games are perfect for her because they are short games that she can hold her attention onto long enough to make it through the entire game. Not only are the Take 10! games perfect for a smaller child they are educational as well. With colors, counting and using your motor skills. The Take 10! 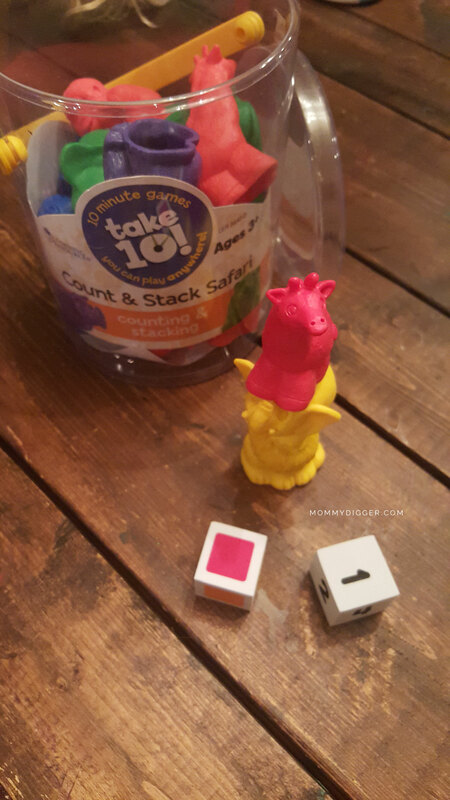 Count & Stack Safari games lets your children do all of these wonderful learning skills while having fun. The animals are super cute and easy for little hands to grab hold of and stack, it reminds me of one of my favorite games, Jenga. To play you roll the cubes and collect an animal of every color or you can choose to try and stack the tallest tower of animals. The girls really enjoy this game and it’s the very first game we can all play together. It’s fun for all ages and stacking the animals is challenging and fun for both the little ones and their dad and me. There are lots of Take 10! Games to choose from including Color Bug Catchers, Count ‘em Up Family Fun, Alphabet Cookies, or Cookie Shape Finders and can be found at Learning Resources.